Except Integrated Sustainability | Reinventing Cartagena´s fortress - How to transform deserted fortresses into major assets for the city. 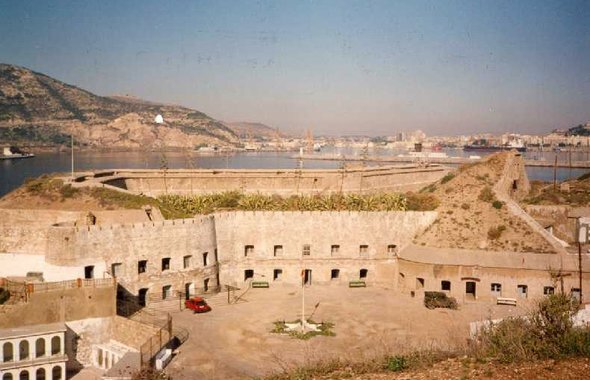 Article > How to transform deserted fortresses into major assets for the city. During the17th century, a fortification system was designed in Cartagena, Murcia (Spain). Several castles, walls and fortresses were built in different strategic places for the defense of the city. Nowadays a few of them have been renovated, but others have been sadly forgotten. They are in dire state due to unfavorable conditions; vandalism, maritime environment and time are harming this piece of city history. All this while the empty fortresses could be transformed into a major asset for the city. Curious how? Read on! All fortresses designed in Cartagena have one thing in common: an exceptional location. They are located next to the sea and offer extraordinary views on the city. There is one that stands out to me due to sentimental value: the San Isidoro - Santa Florentina fortress. As a child, I spent my summer holidays there with my family. There is a small hidden beach at the base of this fortress that used to offer a natural swimming-pool, restrooms that looked like they were still from Roman times, and a bar where my parents had a beer while we played and jumped from springboards. This place has been our summer nook for a long time. Unfortunately, that bar and restrooms are now gone, and the only opportunity left to look at my favorite place of the city is through a fence around the complex. I hope this building will one day revive, allowing this and future generations to enjoy this fantastic environment the way I did. I imagine this building defending our future through innovation and inspiration. I imagine this building full of flowers. Following this idea, I asked myself: in what sustainable way can this empty building be brought back to life? How can this empty building inspire people to build a better future? Which problems of the city could be solved through the application of innovative techniques? Cartagena is an ancient and beautiful city located at the southeast coast of Spain. The main features of the city are the arid soil and the water deficit. The average yearly precipitation is very low, and the high level of evapotranspiration reduces useful rain to 10%. Consequently, the lack of fresh water has been a tenacious problem in the history of the city, and has been particularly noticeable for farmers. River transfers, reservoirs and aquifers, are just a few examples of how Cartagena tried to overcome the lack of rain water. More recently, at the end of the 20th century, the first desalination plants appeared in Spain preventing the droughts of the past. However, the actual production of these desalination plants is only one fifth of the initially projected capacity, while the technology used is expensive and requires a high amount of energy consumption. The consequences of this are that the price of freshwater in the region of Murcia is one of the highest in Spain. The main idea of this project is to provide new ideas to soften the fresh water problems of the city using the surrounded sea as the main source. Even though our first intuition tells us that is impossible to cultivate crops in the arid soil and without fresh water, innovative projects can change our conventional way of thinking. Nowadays there are many projects around the world that are using seawater and solar energy to transform traditional agriculture. Take for instance the Seawater Greenhouse. This greenhouse was invented by Charlie Paton in the 1990´s. It combines the use of the sun and the sea to create cool humid conditions inside. The process recreates the natural hydrological cycle within a controlled environment. This model of greenhouses, in which vegetables, fruits and flowers can grow, is more efficient in warm and arid locations with easy access to the sea, like the Spanish southeast coast where our fortress is located. Aquamaris, an organization researching about the benefits of using seawater, offer us another good example. 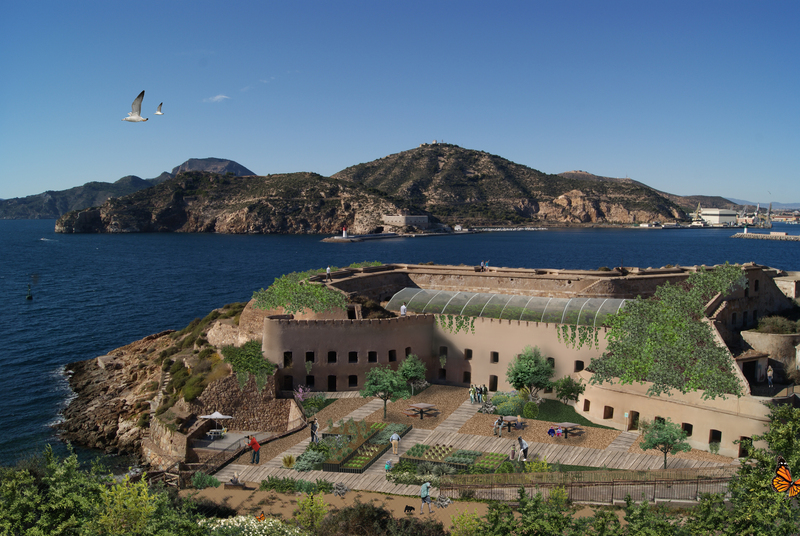 Among all their projects, there is one that is particularly suitable for the surroundings of the fortress: a garden that uses seawater on the base ground. 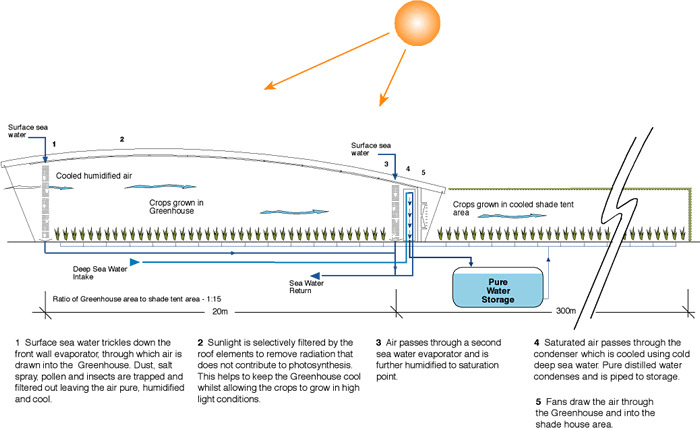 This innovative garden obtains fresh water through evaporation instead of irrigation. The seawater placed on the ground goes up by capillarity while the soil filters the salts. They use different levels to check the diverse species and the distance between the crop and the salt during the seasons. The application of these projects can help to soften the water problem in Cartagena, however, in order to be able to enhance a resilient and a more attractive area to the citizens we need to combine them with other activities. In addition to the main seawater projects, an ecological tourisc point is proposed. The building and its surroundings combine different functions to provide a flexible route to the tourists. The route starts at the casamates, were the cannons used to be placed. These connected rooms have been transformed into museum rooms showing the story of the city and its historical and current freshwater problems. After them, the visitors arrive to the core of the complex: the Seawater Greenhouse. This is the place where adults and children can experience an alternative approach to soften the fresh water problem, and observe how this innovative system allows flowers and vegetables grow thanks to the seawater. Outside the building, the visitors have the opportunity to interact with the seawater gardens structured in different levels. The next stop is the small beach, with a new bar and restrooms, which provides some rest to the adults and entertainment to the little ones. The route finishes at the chief officer house located at the entrance. The house has been turned into a local market place where visitors can buy the products grown in the fortress and taste them in their next meal at home. One of the problems of the fortress is the poor accessibility from the city center. Nowadays, the only way to reach it is by car. The creation of pedestrian and bicycles paths for visitors would be a tremendous improvement for this area. Furthermore, they would provide a less polluting alternative to reach the main beach of Cartagena located 50 meters further. Moreover, due to the sun exposure, sturdy winds and organic waste generated in the area, the building can be powered by renewable solar, wind and biomass energy. This would reduce the building reliance on traditional energy sources. To realize the above stated measures, cooperation is essential. 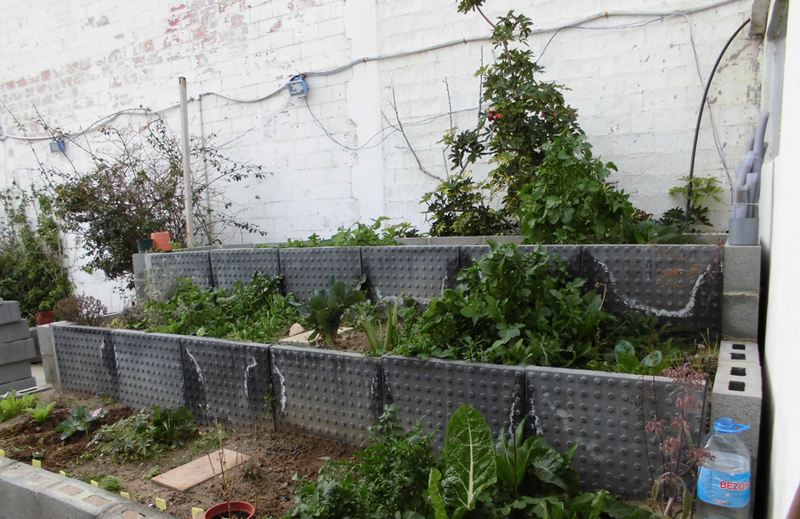 This project is an excellent opportunity to connect parties such as Aquamaris and I+D+I Department of the University of Cartagena to explore the alternative that seawater offers to urban agriculture. In addition, public and private organizations have to be involved. The cooperation of Aforca, Cartagena Puerto de Culturas, the Harbor Authority and the City Hall is indispensable to promote eco-tourism. This eco-tourism will encourage the responsible use of our resources and innovative technologies inspired by nature, and will help to ensure the sustainable development in our cities. At Except we created the programs Urban Renaissance and Future Proof Buildings because we believe that empty buildings and harmed urban areas can be transformed into resilient, flourishing and sustainable places where people can work, live and play using innovation and system understanding as the main tools. 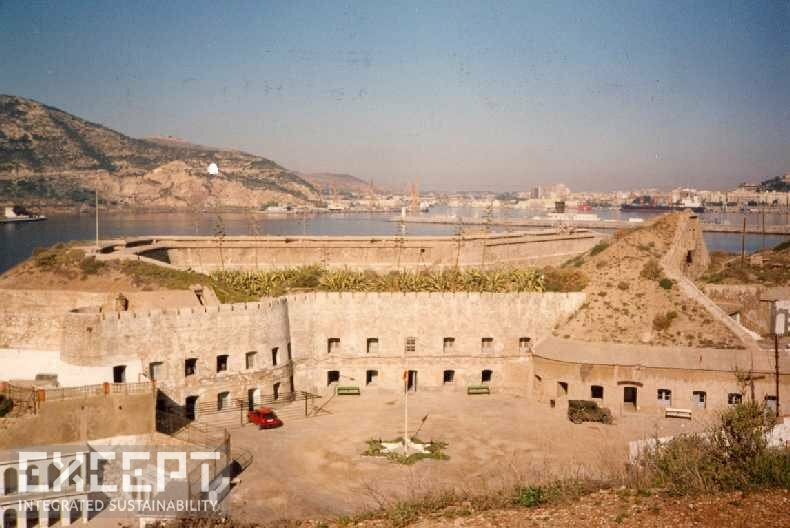 The aim of this article is not only to revive a particular abandoned fortress but also to develop alternatives to our traditional way of thinking that can soften actual problems of Cartagena. I see San Isidoro- Santa Florentina fortress as an example of a new approach to managing the urban environment. It is essential to start thinking that every empty or problematic space in our cities may be the key to revive the areas in which they are located, not only economically but also solving current problems using the correct tools and analysis. And for this, investment in innovation and cooperation between stakeholders are crucial.